Nowadays, most of us keep our loot safe in the bank. But this wasn’t always the case. For hundreds and hundreds of years, people stored their valuables at home. During the Middle Ages, people stored their money in a bowl or jug in the kitchen. Similarly-shaped banks made from clay were also used in Asia and Indonesia. In ancient Greece, banks were often shaped like a temple. Money boxes have been found in the ruins of Pompeii. A 650-year-old English piggy bank recently sold for $10,000. 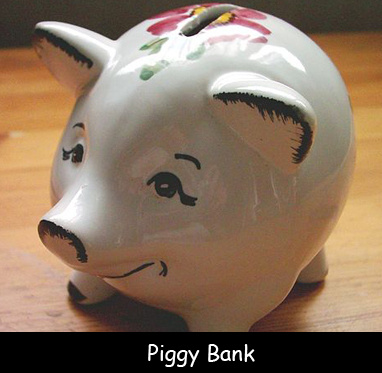 Today, piggy banks usually have a removable button on the bottom to access cash. During the Great Depression, many banks failed and people lost their money. People who grew up in that era are often still skeptical of banks. It’s not uncommon for people to keep extra money in their home – in cookie jars, under the bed, or in drawers. Great Depression: a time during the 1930s when the world economy collapsed. Millions of people lost their savings and jobs. Question: Is keeping money in a bank safe? Answer: Your money is very safe in the bank. The federal government insures banks now (promises to protect your money in case a bank fails). Learn more about how banks work today.